Someone took the pain of organizing the members of Indian parliament information from 1951 to 2011. 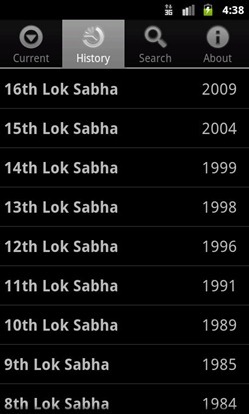 The result : a highly useful Lok Sabha app. Developed by KCP Technologies Ltd, Lok Sabha Android app is a highly useful and highly functional mobile application. Lok Sabha is KCP’s first Android app. 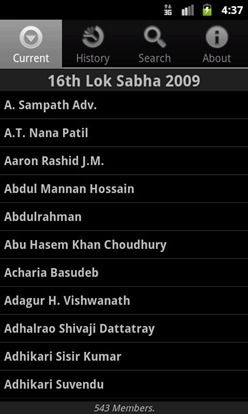 Lok Sabha app lets you search the MP database by MP name, constituency, state, party and category (OBC, general etc…). It has a neatly organized list of the years in which Lok Sabha was elected and the corresponding MP’s during that term. Searching on a particular constituency like Bangalore Rural will give you the list of MP’s elected to Bangalore Rural constituency ever since the constituency came into existence. Does the app track MP resignations? Given its local database usage, I doubt it would! Lok Sabha app works on devices running Android 2.1 or higher versions. The app has seen less than 50 downloads so far but most of the downloads were done on a single day after it was released on July, 29 2011. Lok Sabha can work in a complete offline mode as it uses a local copy of SQLlite database. This nicely done app should give ideas for many more useful apps focused on India. There is no equivalent iPhone app for Lok Sabha. When it comes to apps, Android is the way to go. Now general knowledge will be on our fingertips. Hope to see an application for Rajya Sabha and Vidhan Sabha soon.